Nothing signals fall like the closing of Fashion Week, Back to School, and Labor Day Celebrations. Fashion and bargainistas are scouring sale racks for apparel appropriate for next season as well blending summer pieces. Remaining stylish and season appropriate during transition can be accomplished with hints of season's prior and current trends. 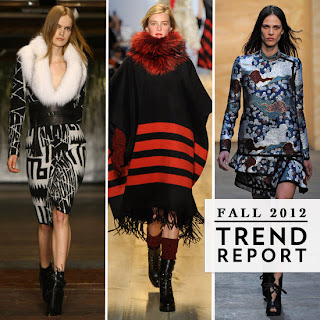 Fashion experts from New York's Fashion Week state that every fashion savvy woman should keep her eye on granny chic, florals, mixed patterns, military gear, and shawls as the go-to pieces the trend setting threads. 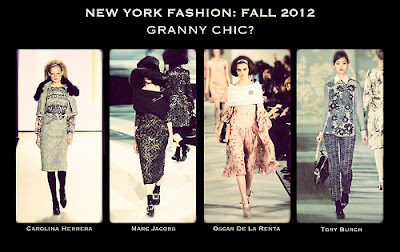 Granny chic consists of flowing bottoms, feminine materials, lace, soft pieces, and a change in hemlines. Granny chic is heavily coupled with an 80s inspired glam shawl, opaque tights, and the return of a pointy shoe. Casual days call for a fuss free spread of military inspired pieces which include camouflage, browns, olives, and pieces with studs. It seems that Fall 2012 is a playground for fashion creativity which one can easily find tops, bottoms, and gems for individual fancy. Fall is upon us I am not a fashionista but I do love the boots...the ones with the fluff in them lol. LOL @ Kita. I am wishing you a lovely pair of Ugg Boots...they are nice and fluffy inside. Oh how I love rocking boots, blazers and sweaters! I do not own a green jacket so I definitely want to look into purchasing that this fall. I love boots and blazers as well! And I'm a big fan of the military look. I either dress it up with pumps and accessories or dress it down with sneakers. I might even grab some combat boots for the cooler months! Looking forward to cooler temps. I am definitely not a fashionista, but I do enjoy layering for fall. Boots, Boots, and Boots!!!!! LOL!!!! You can just never go wrong with Boots & Blazers... wear them with your summer dresses and turn that Summer dress into a quick FALL FIT! @LA Lynn's Aww yes Lynn, great suggestion. I can't wait to see what you put together. You're always so fashionable. I'm all for military inspired garments but granny chic I'm a little weary of. Anything that adds bulk to my curvy frame gets a sideeye! Can't wait to wear the camouflage trend I think is so chic. All about the statement coat and burgundy for me.